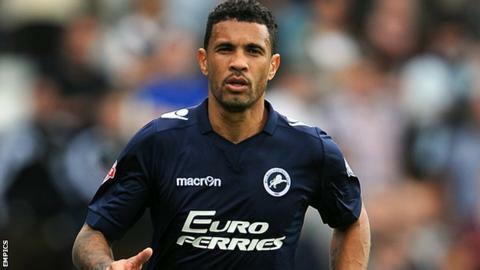 Millwall full-back Carlos Edwards says the club's chief executive Andy Ambler has set the squad the target of a top-six finish in the Championship. The Lions narrowly avoided relegation last season but are fifth after five games of the new campaign. "Five of the senior players sat down with the chief executive and set out our intentions," Edwards, 35, told BBC London 94.9. "He made sure that he said he expects nothing less than the play offs." "There is still a long way to go. It's tough, but it's not impossible and we have a great bunch of lads at this club who are capable of doing just that." The south east London side have won three of their opening five league games this season and the right-back insists if they continue playing like they are at the moment, then the possibility of promotion cannot be ruled out. "To come to a club that has been struggling for the last two years - and for the good start that we've had this season - to finish in the top six is going to be something remarkable," the Trinidad and Tobago international said. "But that's our aim, our intention and our goal; to do as well as we can because we don't want to settle for anything less. If we finish in the top two it's a bonus. "There is still a long way to go. "It's tough, but it's not impossible and we have a great bunch of lads at this club who are capable of doing just that." Millwall survived relegation last season on the back of an eight-match unbeaten run, which included wins away at Nottingham Forest, Wigan and Middlesbrough. Edwards, who was on loan at The Den from Ipswich at the time, says he thinks the self-belief the players found then is still with them now. "I think the lads went away and reflected on the things they didn't achieve," he said. "I think they did a bit of soul searching and in pre-season the guys came back a completely different bunch of guys; all thinking alike, working for each other, working with each other, and as you can see we are reaping the rewards from that." Following his loan spell, Edwards signed a permanent deal with Millwall in the summer. He returns to Suffolk with the Lions for the first time on Saturday. The former Ipswich club captain has many fond memories - but some bittersweet - of his five years at Portman Road, where he eventually found his playing opportunities limited under manager Mick McCarthy. "Mick was saying to me to be patient with him," he said. "I thought that I was patient long enough because I didn't play for about 17 games. I wasn't even in the squad - there were times I would be in the stand. "I thought 'this is not right'. So when the chance came to come on loan [to Millwall], I took the decision because I wanted to prolong my career." And while he wants to continue playing for as long as possible, Edwards also knows that if he wants to get his coaching badges he will need to start thinking about doing that soon. He said: "I would like to play as long as I could, as long as the manager is happy with me and my performances and my legs are saying I can still play 30 or 40-odd games a season. "I am willing to do that, but only time will tell. "Maybe I'll have a word with the gaffer, see if he can show me a few things or give me some advice about how to go about things. I hope he doesn't give me any of his crazy advice!" You can hear full commentary of Millwall's game at Ipswich on Saturday on BBC London Digital Radio.